A Step-by-Step guide to the Mortgage process. Unless you are a premiership footballer or a chart topping musician, buying a house is the largest financial transaction most people will carry out in their lives. So it is important to find the right mortgage deal for you and your finances. There are many different lenders in the market. Well known high street banks as well as less well known regional based old style building societies. Each can have their own criteria for lending or underwriting and special deals for different customers and hence different advantages and disadvantages. The rate is important, but it should not be the only benchmark for selecting a lender. Other objectives that may be important to you needs to be considered. Therefore, the lender with the lowest rate may not be the best suited to achieve your goal of buying a home. Maximum allowable loan or income multiples/ affordability. Types of income considered e.g. part time, second jobs, benefits, pension. 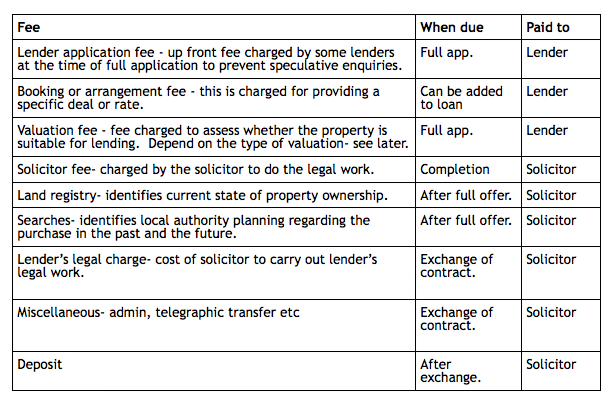 Cost of the loan or the fees (see our rate comparison guide pg ). 2a.Following criteria are important when choosing a rate. Chart below shows how different rates relate to each other and how the change in Bank of England rate can affect them. The rate charged by each lender is depend on the rate they will pay to borrow money in the money market from other lender’s as well as the bank of england (first Thursday of each month is when the BoE committee meets to decides what the new rate will be). Five main type of rates. Fixed rate – where the rate is fixed for a limited period (rate control period) or for the whole term. Tracker – is a variable rate that tracks a default rate. This could be the Bank of England rate or the lender’s standard variable rate. There are different advantages to the different methods of tracking. Ask your broker to explain the difference. Discounted/ variable – where the rate given is normally a discount from the lender’s SVR. Lender’s standard variable rate – this is the normal rate a lender would lend money and is based on the cost of borrowing in the money market. Other rates are really a perk to attract customers. Bank of England variable rate – the rate bank lends to the money market. 2c.What is the rate control or tie-in period? Usually the special rate you receive is for certain period only. This can be none, to 1 to 5 years and even whole of the term. You are obliged to stay with the lender during this period. However, you may leave after paying the redemption penalty. If the total of the loan is redeemed or paid back within the tie-in period, the lender will generally apply a penalty or a fine. Further information in KFI document. See also portability. 2e. Portability- means that all loans can be transferred to a new property (in the event you want to move) even within the tie-in period without a penalty. 3. Decision / Agreement in Principle. This is the first phase of the application process. This is when the credit searches and scoring is carried out to determine if a lender will accept you as a client and the amount they can lend. Things that influence the credit score: credit conduct history, other outstanding loans and credit, electoral role, job, age. There are some lenders who do not carry out credit searches and have a more flexible approach to underwriting. Your broker would be able to give further information. Factors that influence credit score and the DIP or AIP. existing mortgage, credit or credit history. 2. Level of deposit – Again obvious. 3. Ability to prove income or not. lower income, but also lower debts. 5. Adverse credit – see below. income. All applicants must prove income before application. No income, no mortgage. application through their internal systems, you must provide valid documents for income and id which will be kept on file for compliance purposes. This is very important as some lenders can ask for documents up to six months after completion. See above for proofs of income acceptable. What to do if you have a poor credit? Such things as defaults, agreements to pay, CCJs, IVAs and bankruptcy will affect you ability to obtain a mortgage. There are some lenders who may be able to help, so talk to your broker for possible solutions. a/ Arrears : when a payment on a credit agreement is missed and have fallen behind. missed payments. Remains in the file as long as the outstanding debt. Before a CCJ a default notice will be issued. over number of years e.g. 5 yrs. Must have unsecured debts of approx £20k. You will keep certain assets e.g. house, car. If in any doubt you should check your credit file and forward to the mortgage adviser before application. Following are two main credit search organisations used by lenders. Some lenders nowadays do “soft credit scores”, i.e. do not leave a footprint on credit file, but it is better to know exactly what the issues are, without going through the trouble of submitting an online DIP. The DIP can give 3 results. 3. Referred to a human to look at. 4. What is a Key Features Document? Provides a detailed breakdown of the mortgage loan, including fees, charges and other relevant conditions. You should read this document and ensure that you have the mortgage you wanted. 6. Types of valuations or surveys. There are three types. The costs increase with each level. The survey is carried out by a lender appointed, but registered surveyor. If you are looking for a higher level survey, you can save money by asking for the same valuer as for the basic to carry out the additional work at the same time. Basic valuation- the simplest form required by the lender to establish that the property is valued at the purchase price. Homebuyer’s report- this is for the benefit of the buyer. Since March 2010 a new type of Homebuyer Report was introduced (licensed by RISC) with a traffic light system condition ratings to highlight potential defficiencies in the property. See our website for a sample and further information. Condition Rating 1 (green) – No repair is currently needed. The property must be maintained in the normal way. Condition Rating 2 (amber)- Defects that need repairing or replacing but are not considered to be either serious or urgent. The property must be maintained in the normal way. Building or Structural Survey- A thorough and extensive survey of internal and external structure. Recommended for older property over 75 years old, or a property that hasn’t had a recent survey or you are looking to alter or renovate any of the structures. 7. Documents that you may need to provide to the lender. valid passport, photo card driving license, gun license. additionally documents for right to reside or visa details. Proof of address – a recent (within last three months) utility bill, bank or credit card statement, council tax statement. If you are self-employed it is important to understand that the lender will only take net income declared in you accounts and not the gross profit or turnover. Some lenders will request confirmation of income declared in the form of SA302s from the HMRC. For the employed the proof of income will be in the form of either last 3 payslips and latest p60. Some lenders can ask for 3 month;s payslips as well. You may not need to provide all these documents. Talk to your mortgage adviser to find out what each lender requires. 8. Methods of paying a mortgage. Guaranteed to pay off the mortgage over the term. Debt to the lender is reduced with time. However, no significant reduction in the loan may be seen in the initial years. Total interest paid to the lender over the whole term will be lower. Problems with negative equity will be lesser. In the event of loss of employment due to a long term illness or redundancy, the State support is restricted to repaying the interest part of the loan only. The borrower is responsible for paying the capital part. Temptation to extend loan term at each additional borrowing and/or house move to maintain monthly outgoing at lower level, thus maintaining a loan for a longer period. May require new life policy at each house move at a higher cost due to increased age and possible health problems. Where only interest is paid monthly and the capital borrowed is repaid at the end of the mortgage term. The mortgage capital is to be repaid by a separate repayment/saving plan such as an endowment, pension, ISA, etc. Flexibility when moving house. The saving plan can be taken with the house move and topped up to achieve an increased target or even a different type of plan or repayment method can be set up to suit new circumstances. Flexibility in repayment method e.g. PEP/ISA, pension, endowment, etc. Possible attainment of the target before the term allowing the mortgage to be repaid early thus saving on interest payments in the latter years or higher than required returns at maturity. 1. Waiver of premium benefit during long term illnesses on endowment will pay the premium of the plan thus ensuing that with the payment of interest by social security, no extra capital needed to maintain mortgage payments. 2. Cheap life cover & low cost critical illness protection. The maturity value of the repayment vehicle may fall short of the required target. Requiring the customer to find the shortfall. No reduction in the debt to the lender over the term of the loan. Negative equity This can affect interest only mortgages more than repayment loans for the above reason. It is your responsibility to arrange and maintain the repayment vehicle to the end of the loan term or until the target of the loan is achieved. Failing to maintain or arrange a repayment vehicle and subsequent inability to repay the loan at term may lead to the lender repossessing the property which would be sold to recover their loan.